The stunningly beautiful, 1890′s embossed and extensively gold gilt-encrusted chromolithograph advertising sign pictured above is among the most striking pieces of advertising we have ever come across. To say that the chromolithography is of THE very highest quality is a gross understatement – this sign is the consummate example of the very finest art and craftsmanship of the Lithographic Art. 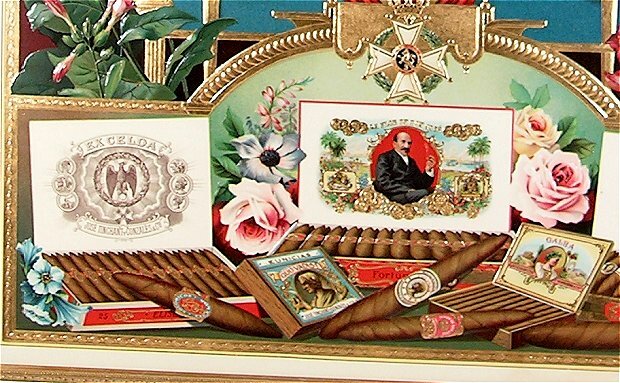 It is signed by the lithographer – Hermann Schott, who along with Klingenberg Bros., produced many of the most elaborate and highly sought-after cigar labels of the same style and period. But above and beyond the beauty of the sign, it is its content wherein lies the story. The sign advertises “Don Jose” Cigars manufactured by “Jose Tinchant y Gonzales & Co. Cigars,” owned and operated by transplanted African-American Cigar maker, New Orleans Creole “free man of color,” and second lieutenant in the 6th Louisiana Volunteers (Colored) during the Civil War, Joseph Tinchant. At the center of the sign is a stunning portrait of Joseph Tinchant, himself! Although the factories of “Jose Tinchant y Gonzales & Co.” were located in Belgium, the company had extensive American connections. Three generations of the Tinchant family lived and worked in New Orleans. The patriarch was brought from Africa in slavery to the island of Haiti, and was emancipated during the Haitian Revolution of the 1790′s. He married a woman who was the child of a white man and a free woman of color, and the couple immigrated to Louisiana where, as a “free man of color,” Jacques Tinchant (father of Joseph and Edouard of “Jose Tinchant y Gonzales & Co. and son of the freed Haitian slave) married a mixed race woman and spent his life in various business interests which straddled the line between the white and Creole communities of New Orleans. While census records describe Jacques Tinchant as a “f.m.c.” (free man of color), in his business dealings that designation sometimes appeared and sometimes did not. It was not that Jacques was “passing for white” (as the designation would disappear and reappear over and over), but the stigma associated with that designation was sometimes “inconvenient” to the customers (white or black) that he was dealing with. When Union forces captured New Orleans in 1862, Joseph Tichant helped to raise the 6th Louisiana Infantry (Colored) and was commissioned as a second lieutenant. His brother Edouard enlisted in the regiment. After the War, Edouard became the representative of the 6th Ward of the city of New Orleans, at the Constitutional Convention of the State of Louisiana in 1867–68, a Radical Republican convention made up of mostly men of color which framed the Louisiana State Constitution that took effect during Reconstruction. By 1877, with the end of Reconstruction in the South and the plight of African Americans there firmly in the hands of the segregationist elements, Joseph and his brother Edouard had again crossed the Atlantic and joined their brothers who had established a cigar factory in Antwerp. 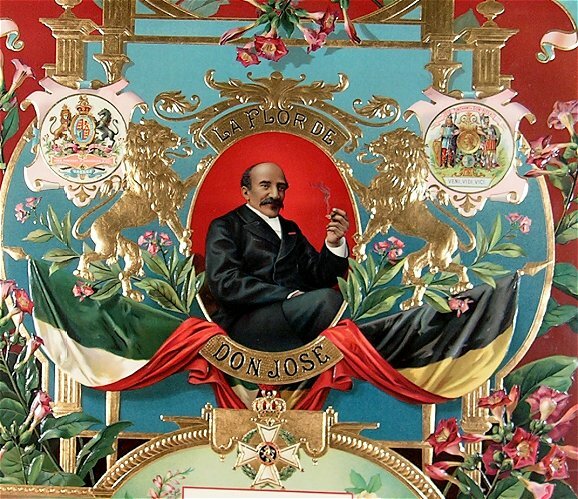 Joseph took on the name of his wife – Gonzales – and modified his own name to reflect a Cuban heritage (a great advantage in the cigar industry – even if most of the tobacco for the cigars manufactured at the factory came from Mexico). 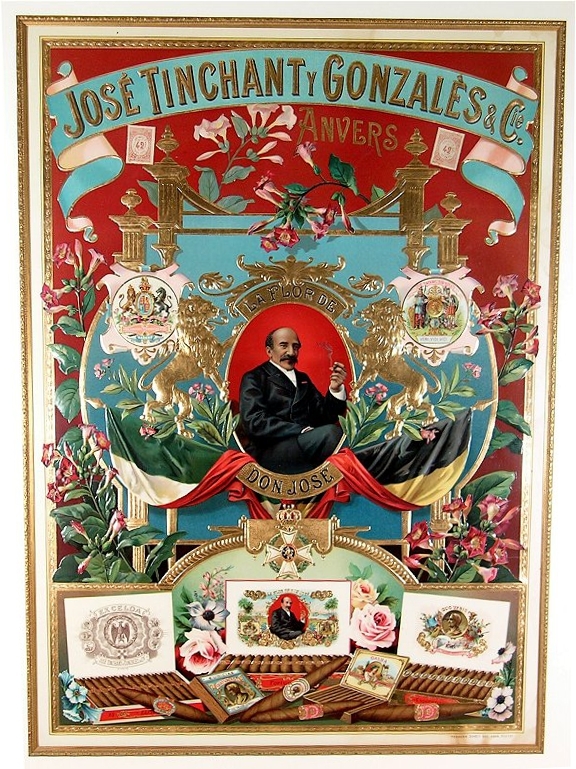 The company name was changed to “Jose Tinchant y Gonzales & Co.” Their premier brand was “La Flor de Don Jose” with a portrait of Joesph on the cigar’s label and cigar band. Click here to read more about the fascinating history of the African American Tinchant family. This entry was posted in Collectibles: Advertising, Collectibles: Printing and tagged advertising, african american history, american civil war, chromolithograph, cigar, cigar box, free man of color, joseph tinchant, joseph tinchant y gonzales cigar co, lithography, louisiana, reconstruction, tobacco, tobacco history, tobacconist. Bookmark the permalink. I came upon your website on google and check out a few of your early posts. Stick with the very good posts. Ill probably be by again to read more, thanks for the post!.